To dream that you perform ablution with clean water indicates that you will reach your goal and your financial problems will be solved. To see that you leave perform ablution unfinished in your dream implies that time is needed for reaching your goal. To dream that you couldn’t perform ablution signifies that you will lose one of your valuable things and you will find that thing from unexpected place soon. To see of performing prayer after performing ablution in your dream signifies that you will overcome the whole negative, bad financial problems. You will be relaxed financially. To dream that any other person performs ablution signifies that you will pay your debt and you will reach a state of comfort and harmony. To dream that a sick person performs ablution implies that you will get divorced. However, after this situation, the obstacles in front of you will destroy and you will be more successful. If you are single, you will go away from your friends because of your job. 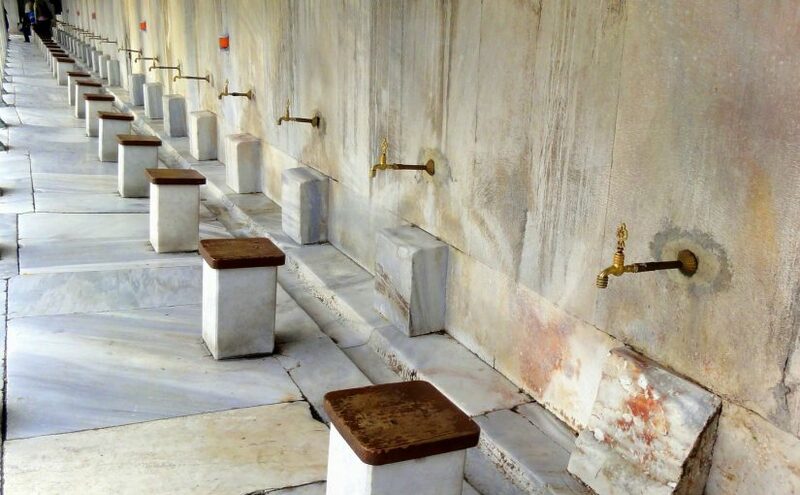 To see of performing ablution with hot water in your dream indicates that money will be spent because of health issue and the person who has health problems will overcome disease. To see of performing ablution with cold water in your dream denotes that you will get away from troubles and poorness. To dream that you perform ablution in a mosque signifies that your friends speak about you but these conversations are favourable. To see water cut off as you perform ablution in your dream indicates that your achievements in your job or school will increase and everyone will put you first.